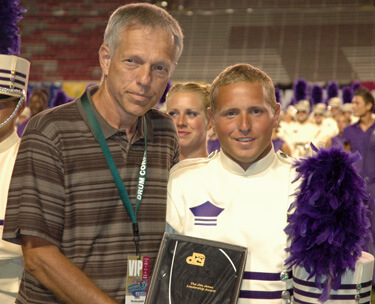 The Jim Jones Leadership Award was awarded to Carolina Crown drum major Bob Beasley at the Division I Finals on Saturday, Aug. 12, during the finale of the 2006 DCI World Championships. Beasley receives the Jim Jones Leadership Award from Gene Monterastelli. "It means an incredible amount to me to receive this award," said Beasley. "It's recognition of the hard work I've put in for the past three years as the conductor of Carolina Crown. There are a lot of great instructors who helped me along the way to earn my position and give me advice. I was constantly working because I believed the better I was, the better the chance the drum corps had to become better." "Leading the corps was a lot of fun, too. The leadership positions are taken very seriously in the organization. It's great to know you have that kind of impact upon your drum corps when you're serving in that position. I always enjoyed the conducting, so my favorite times were night ensembles. Another fun part was just getting the chance to interact with a bunch of different people all the time." The award is given to a Division I drum major based on leadership skills. Beasley, in his fourth and last year with the corps, went through a series of qualifiers which began with a nomination from Crown's corps director, Kevin Smith. This was followed by a resume submission and interview with DCI Hall of Fame member Gene Monterastelli, a former DCI judge and instructor. Monterastelli then gave tapes of each interview to the DCI Hall of Fame committee who also judged the on-field performances of each contestant during the world Championship Quarterfinals. Beasley has one year of college left at The College of William & Mary in Williamsburg, Va. He is double-majoring in finance and government and plans on pursuing a career in the financial field. With assistance from contributing author Christina Mavroudis-Dempsey.